Sunday, April 22nd, marks Earth Day, an annual reminder to advocate for environmental protection. Currently, Earth Day is celebrated in over 192 countries around the globe. It’s a day on which over 1 billion people will march, sign petitions, meet with their elected officials, plant trees, and clean up their towns and roads. When celebrating Earth Day, it’s essential to remember how fundamentally tied our beautiful earth is to the health and livelihood of mothers and children. For example, the effects of climate change disproportionally affect mothers and families. This is especially true for regions where mothers are involved heavily in agricultural work or rely heavily on natural resources to provide for their families. These effects, however, are not limited to rural regions. Mothers who live in cities are exposed to air pollution, toxic chemicals, and the same drastic and often dangerous shifts in weather that affect women in the countryside. This is just one example. 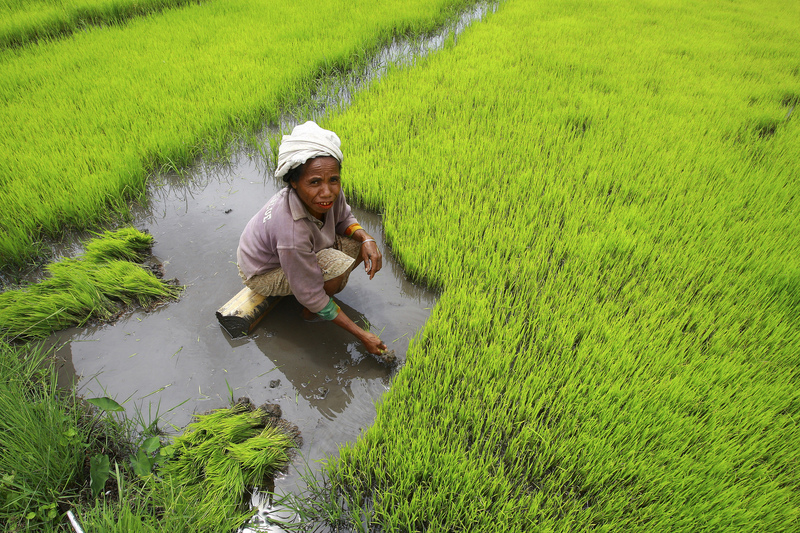 A woman harvests rice by hand in Timor-Leste. United Nations. Another example? Air pollution. A child’s lungs develop throughout their childhood and take a great deal of time to reach adulthood. Babies take about 40 breathes per minute, while adults only breathe 12-20 times per minute. In girls, lung development is completed by the age of 18 while boy’s lungs develop into their 20s. Air pollution, whether in a city or within the countryside, can deeply disrupt the development of a child’s lungs. Even while pregnant, the effects of tobacco smoke or tailpipe emissions can cause inflammation within the lungs of the soon-to-be-mother and her unborn baby. This can disrupt blood vessels in the heart and placenta of the mother. And, this in turn harms the respiratory development of the child. This Earth Day, you too can protect our Mother Earth! The main focus of this year’s Earth Day is to End Plastic Pollution. Earth Day Network will educate millions of people about the health and other risks associated with the use and disposal of plastics, including pollution of our oceans, water, and wildlife. To find out how you can reduce your use of plastic, check out this guide provided by the Earth Day Network. But your action does not have to stop there! There are many ways you can protect Mother Earth this Earth Day, especially when it comes to making the environment healthier, so that families can be healthier too. Take a look at our “Take Action Challenge” to see a few ways you, your family, and your community can help. Learn about these related UN Sustainable Development Goals: Climate Action, Affordable and Clean Energy, Life Below Water and Life on Land. Plant a tree! Check out this tree planting map to see where the Earth Day Network has planted trees. Volunteer to clean up a local park! If you are in the US, check out volunteer opportunities here. Organize with other moms! Check out these groups: Climate Parents, Moms Clean Air Force, and Mothers Out Front, or consider starting your own.